Edgar’s Gift is a charity set up in 2010 in memory of Ben Edkins, who passed away following a year long fight with cancer. 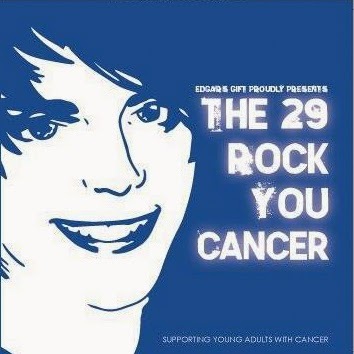 One of the projects is a 29 track compilation CD entitled "The 29 Rock You Cancer" with all tracks donated by the bands that appear on it. Ben was just 25 when he died after battling Rhabdomyosarcoma, a rare and aggressive form of muscle cancer. The charity was founded by Ben’s parents Julie and Neil Bradman, alongside Ben’s family and friends – all of whom Ben influenced and had a special and positive effect on their lives. Edgar’s Gift aims to raise money to enable us to provide special days out, unique experiences and luxury gifts for young adults aged 18-30 who are suffering from cancer. The fundraisers at Edgar’s Gift work tirelessly in order to raise money for those unfortunately suffering from cancer. They organise events large and small, from quiz nights and raffles, sponsored walks all the way up to football games. Edgar’s Gift has links with local hospitals that make them aware of people who need their help and also applications can be made through their website. The charity strives to provide treasured and memorable gifts and experiences to ensure that those who are suffering can enjoy rare moments. Things they've done, with the generosity of donations and fundraising include days out at Leicester City and Leicester Riders, laptops, XBoxes, musical instruments, whatever helps the young person in their fight. The Edgar's Gift website can be found here. You can either donate or buy the CD or contact them with offers of support. It's also available on iTunes. They also have a Facebook and a Twitter page.